Falkus demanded to be noticed and then had a talent for behaving badly as soon as he had been. Life dealt the man a tough hand and it took him half his life to discover how to play it; though he never completely mastered the art of being Hugh, nor did he ever conquer his habit of testing relationships to destruction. Falkus was born in 1917, during, by his account, a Zeppelin raid and from that moment on, truth and illusion began to blur until even Hugh would have been hard put to say what actually happened. The man grew up a strongly religious household which left him ill-prepared to handle the volatile cocktail of his personality, with the result that he married four times and left at least that number of children abandoned in his wake. One of his wives drowned, very probably as a result of Hugh’s lust for glory, and he filled in any boring moments by having numerous affairs. Hugh drank to excess, he was didactic, he was appallingly self-centred but immensely charismatic, which meant that such friends as could stand him kept coming back for more and he wrote as if he was inspired by the devil, which for all I know, he may have been. For most of his life, Falkus cut a pathetic picture and yet out of this apocalyptic mix a great communicator emerged, who wrote some outstanding books and changed the course of sea-trout fishing for ever. Love him or hate him, Hugh was quite an item and if you haven't read The Stolen Years, then get it. Biographers writing soon after the death of their subject face a difficult problem navigating the sensibilities of those left behind and a couple of recent angling biographies would have been much more informative had they been left a decade or so. 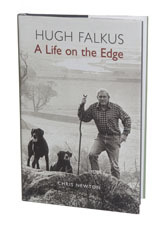 But Chris Newton has pulled off the difficult task of writing an unbiased and truthful account of Falkus while his memory was fresh in the minds of those who knew him best and A Life on the Edge is the most astonishing book. It hasn’t won any awards yet, but I would definitely rate it the best biography of an angler published this past half decade.